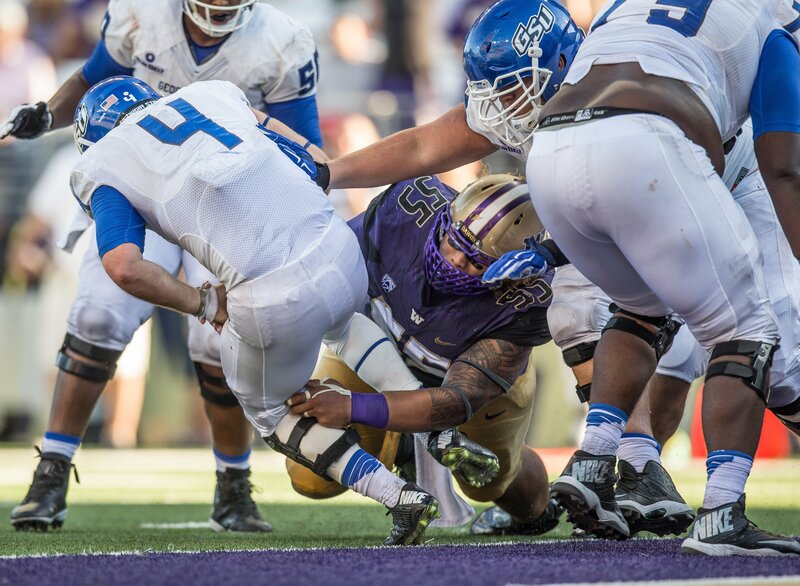 Washington’s Danny Shelton is a massive nose tackle that moves better than most players his size. Last week I wrote about the Big Cat. This week I’m writing about a player that some have called a dancing bear. Washington’s Danny Shelton is a 6’2” 340 pound nose tackle that moves better than anyone I’ve ever seen at that size. The following video shows his workout at the NFL Combine. The last minute of the video shows how nimble he moves for a 340 pounder. Shelton is very stout at the point of attack. He is almost impossible to move off the line and he is someone that demands a double team on every play. Shelton had 93 tackles, 9 sacks and 16 ½ tackles for loss in 2014. These kind of stats for a nose tackle are unheard of. Not only does Shelton tie up the middle, he chases plays down the line of scrimmage to the sideline. Possibly the most impressive stat is that Shelton rarely needed to come off the field. It’s rare to find a player the size of Shelton that can produce play in and play out without needing a breather. Shelton raised some eyebrows at his pro day. He did the workout wearing a traditional Polynesian garment called a lava-lava. At first glance, it looked like he was wearing a skirt. Thank God he was wearing shorts underneath. Danny Shelton is an extremely bright kid that was a first-team Academic All-American. I have seen comparisons to Haloti Ngata and Vince Wilfork. If Shelton has that type of career, he will be a steal for any team selecting him. Most mock drafts I’ve seen have him as a top 10 player and I will be shocked if he isn’t drafted in the top 15. One team that might be interested could be the New York Giants at pick 9. The Giants were near the bottom of the NFL in run defense. The Giants will have to try to stop DeMarco Murray in Philadelphia and I assume Dallas will find someone to replace Murray at running back. If the Giants don’t draft an offensive lineman, Shelton could be an attractive pick for them. No matter who drafts Danny Shelton, I believe he has the ability to become an All-Pro nose tackle. He has the versatility to play in either a three-man or four-man front, but I believe he will be particularly attractive to 3-4 teams. This entry was posted on April 15, 2015 by draftmaniacs in Uncategorized and tagged 2015 NFL draft, Danny Shelton, NFL, NFL Draft.